Below is some feedback from Naomi who is a remarkable young lady – In 2009, Naomi’s world was turned upside down when doctors delivered the devastating news that she had Breast Cancer. In 2010, she was told it had spread and was therefore no longer curable. Blackpool was typically British in every way and we LOVED it! 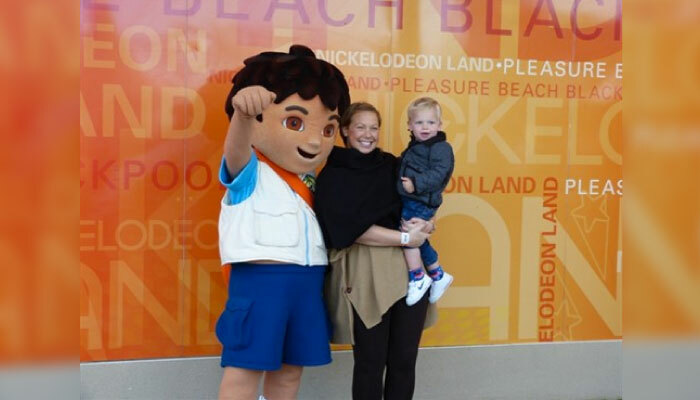 We did so much in the short space we were there, we visited the Pleasure Beach where Devon went on loads of rides and met Dora The Explorer. We also went up the Tower and walked on the glass floor at the top. Graham is scared of heights but even he did it which was lovely. We went to a circus and saw the illuminations and ate candy floss and played on the slot machines. We even dressed up in gangster costumes and had an old fashioned photo taken. So many things that I have always wanted to do were fulfilled. We can not thank you enough for thinking of us for this break. The hotel was in the perfect location, not to far for me to walk with my bad back, the staff were brilliant and the breakfast that was included was MASSIVE! It will be diets all round this week!